Invertebrate diversity on a plate - we see barnacles, serpulid worms, two different solitary tunicates, five different colonial tunicates, hydroids, and sponges. 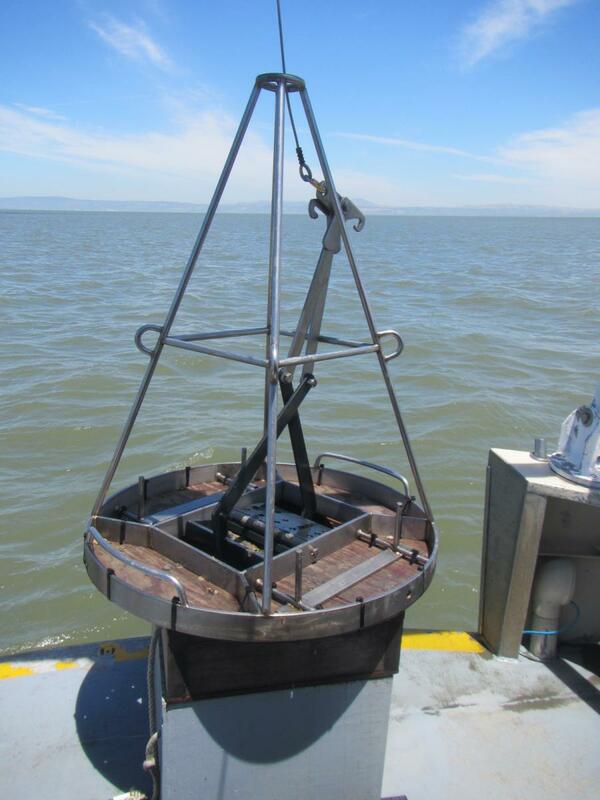 The team uses a modified Van Veen grab sampler deployed from a boat to collect sediment samples. Photo by Haizea Jimenez. We conduct invertebrate surveys in marine and estuarine ecosystems to learn about the occurrence, distribution, and diversity of non-native species in North and Central America. We are detecting new invasions, tracking changes in the community, and assessing the effectiveness of regulatory strategies aimed at reducing invasions. 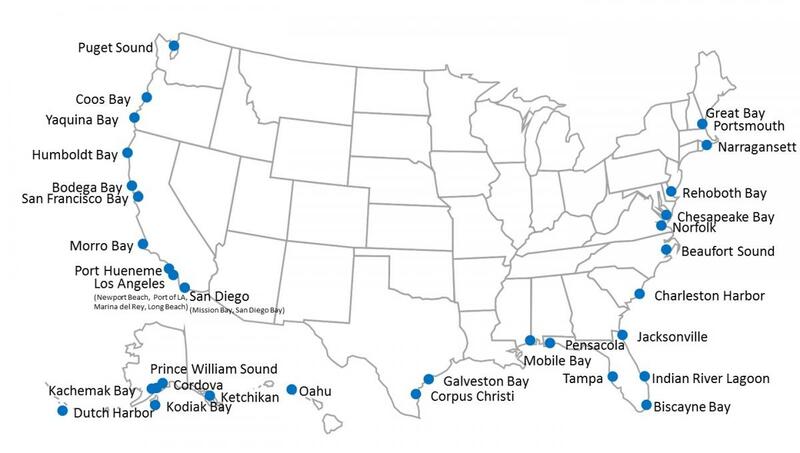 This is a map of the Marine Invasions Laboratory survey sites in the United States. Human activities are moving species around the world on an unprecedented scale. Knowing the basic patterns of distribution and abundance of non-native species is fundamentally important to understanding and managing the processes that govern invasions. We address this need using two complementary approaches. First, we conduct field surveys of marine and estuarine communities to detect new invasions and track the movement of existing invaders. Second, we have created the National Exotic Marine and Estuarine Species Information System (NEMESIS), which is a comprehensive database of information on the current and historical distribution of non-native marine species in North America based on our field surveys and the scientific literature. Our first survey of the fouling community started in Chesapeake Bay in the mid 1990s. Since then, we have done over 150 separate surveys covering all the major bays in the United States and numerous bays in Canada, Australia, Belize, Panama, Ecuador, and more. Most of our surveys (over 130) have focused on the fouling community (animals that attach to hard substrates), but we have conducted an increasing number of plankton and benthic soft sediment surveys in recent years. We expanded our reach further in 2007 with the addition of a citizen scientist-powered survey in Alaska called Plate Watch, which serves an important role in early detection of new invasions. Each of these surveys uses standardized, systematic approaches based on rigorous ecological sampling principles to generate quantitative, statistically robust estimates of the number of non-native species in each location. These surveys provide both a snapshot of the current state of invasions in each location as well as a baseline against which future surveys can be compared. Brianna Tracy pulls up a settlement plate from a marina in San Francisco Bay, CA. This plate is covered with a diverse assemblage of animals that established and grew in just three months. 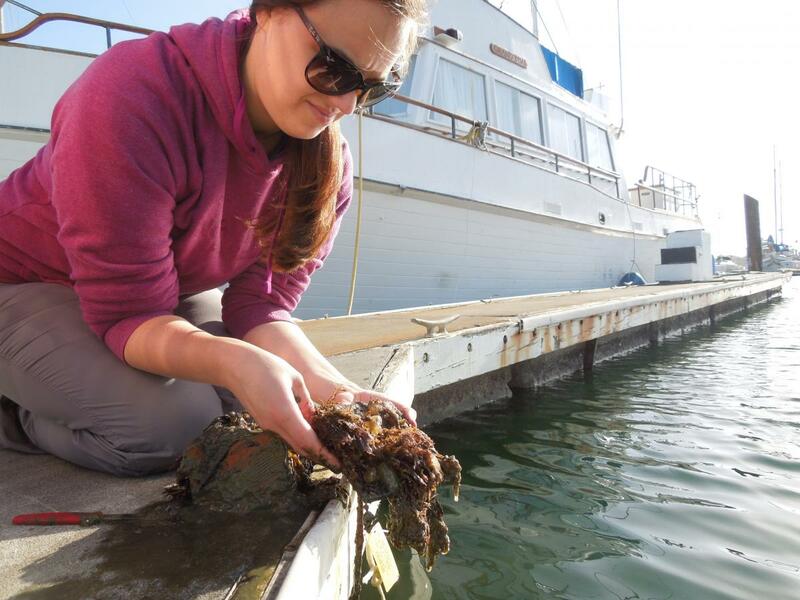 We conduct standardized surveys of the fouling community to document both native and introduced species in bays and estuaries. We study the diversity of fouling communities, how it changes over time, and how new species change community structure, composition and abundance. Fouling communities are groups of organisms found on natural and artificial surfaces like rocks, and the sides of docks, marinas, harbors, and boats. These communities consist of a variety of sessile organisms including ascidians (tunicates), bryozoans (moss animals), mussels, tube building worms (polychaetes), sea anemones, sponges, barnacles, and more. Most of these organisms have a planktonic larval stage and a sessile adult stage that is attached to solid objects. Transport of these species can occur at either stage depending on the species. If the larvae are in the plankton long enough, they can be moved with ballast water. Adults have the possibility of being moved into new geographic areas on the hulls of commercial ships or recreational vessels. We have been studying the fouling community since 1994 with a large team of researchers and taxonomists led by Dr. Gregory Ruiz. The fouling community merits special attention because most non-native marine species are found here. Zebra mussels, for example, are probably the most well-known aquatic invasive fouling species in the United States. Over the 22 years of the project, we have conducted over 130 standardized fouling surveys in most of the major bays on the North American Atlantic, Pacific, and Gulf coasts, as well as Hawaii, Alaska, and Puerto Rico. We have gone as far as Australia, Belize, Panama, and the Galapagos (see map). For Chesapeake, Tampa, and San Francisco Bays, which are major commerce hubs, we have repeated surveys across multiple years in order to detect new invasions and track changes in fouling communities on each coast. We survey fouling communities by hanging settlement plates from docks or other structures, allowing species to settle and grow throughout a three month period during the spring or summer. These plates function as standard passive collectors, which tell us about the diversity and type of species present during a given year as well their relative abundance. Most importantly, they allow us to detect and evaluate changes in introduced fouling species. Spaghetti’s on the Menu in the Galapagos. By Linda MCann and Monaca Noble, October 2015. We conduct standardized surveys of zooplankton communities to (a) document native and introduced species across marine and estuarine ecosystems and (b) evaluate invasion dynamics and changes to community structure. 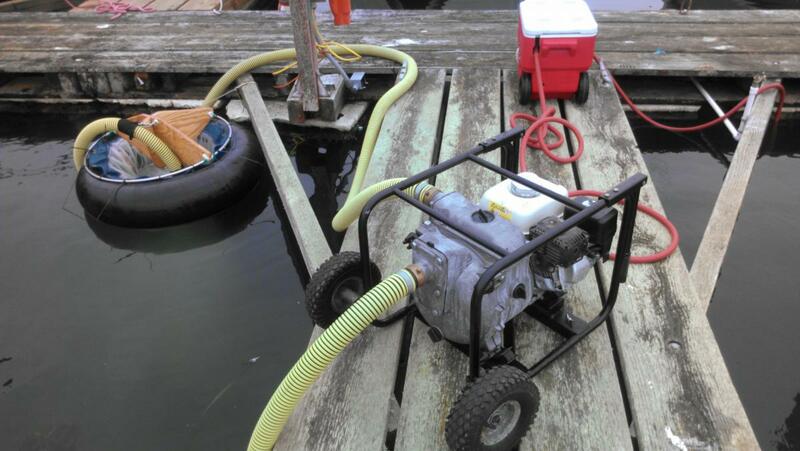 Big Bertha is a portable pump system specially designed to collect zooplankton samples when towing a net from a boat is not feasible, and/or where plankton concentrations are low. To collect zooplankton with Big Bertha we first secure a plankton net into an inner tube and then pump water into the net to concentrate the plankton for sampling. We use portable wash-down hose, the red cooler, to rinse the concentrated plankton into sample bottles using ambient seawater. Big Bertha samples a high volume of water in a short amount of time (hundreds of gallons of water in just a few minutes), producing a lot of force and thus must be secured while the pump is active. Photo courtesy of Ruth DiMaria. The distribution and abundance of zooplankton species remains poorly understood in many coastal ecosystems. This information is crucial for understanding the current status and trends in invasions because many marine organisms, native and non-native alike, spend at least part of their lives in the plankton. Additionally, zooplankton are readily transported by ballast water in oceangoing ships, and are thus an important target used to evaluate the effectiveness of regulatory strategies aimed at reducing invasions (see the project "Shipping Transports Aquatic Invaders"). Zooplankton are a diverse group of organisms that live in the water column, either for their entire lives (holoplankton) or for only a short time during their development (meroplankton). The meroplankton include the early life stages of many sessile benthic organisms from both hard substrate and soft sediment communities, including barnacles, crabs, mussels, and clams. We have been collecting samples of plankton since 2012 from bays with major commercial ports (a known source of introduced marine species) and smaller bays without a direct vessel route for overseas invasions. The bays sampled border all three U.S. coastlines and include San Francisco, Tampa, and Chesapeake bays, as well as smaller estuaries in California and the Pacific Northwest. We use standardized, systematic methods for collection and rely on taxonomic experts to identify species using a combination of morphological and molecular techniques. This survey complements the fouling and soft sediment benthic surveys (see associated tabs). Together these three surveys provide valuable insight into invasion dynamics across these different habitats. Our field team is led by Ruth DiMaria and we collaborate with Dr. Wim Kimmerer at San Francisco State University/Romberg Tiburon Center for Environmental Studies, Dr. Jeffrey Cordell at the University of Washington and Dr. Jonathon Geller with Moss Landing Marine Laboratories. Big Bertha, Adventures in Zooplankton Sampling. By Ruth DiMaria, Arianne Balsom, and Monaca Noble. November 3, 2014. Field crew (Becca & Carl) pulling up a plankton net to process a collection tow in San Francisco Bay near Embarcadero. Image credit Ruth DiMaria. Field crew (Becca, Talene, & Carl) switching out a cod end on a plankton net in San Francisco Bay near Angel Island. Image credit Ruth DiMaria. Field crew collecting water quality data (Talene) and processing collected plankton (Carl) in San Francisco Bay near the Richmond-San Rafael Bridge. Image credit Ruth DiMaria. We conduct standardized surveys of soft sediment benthic communities to document both native and introduced species in bays and estuaries. Through this survey, we study the diversity of the soft sediment community, how it changes over time, and how invasions by new species change community structure, composition and abundance. A modified Van Veen grab used to collect soft sediment benthic samples. Photo by Haizea Jimenez. Marine invasion studies have focused primarily on hard substrates, which is where most invasions have historically been detected. Perhaps surprisingly, there is relatively little quantitative information available on invasions in soft sediment habitats. To fill in this information gap, our team, led by Drs. Haizea Jimenez and Gregory Ruiz, began soft sediment benthic surveys in 2012 starting with major bays along the California coast. Our surveys use standardized, systematic protocols to obtain data critical to understanding the role of invasions in soft sediment communities, as well as helping to assess the effectiveness of management strategies. Soft sediment benthic animals inhabit the soft sandy and muddy bottoms of bays, and include a range of both sessile and mobile organisms. Polychaetes (marine worms), amphipods, and bivalves (clams and mussels) are among the most common animals detected in our surveys. Most have planktonic larval stages, and some have sessile adult stages that live in the top layer of sediment on the sea floor. These animals have been transported to new locations in many ways, including in ballast water, shipments of oysters, and algal packing material associated with baitworms. We take samples using a modified Van Veen grab deployed from a boat. The grab is weighted and suspended from a cable, then dropped onto the seafloor to take samples from the bottom. Our surveys are usually conducted during the summer months, when the greatest diversity of taxa are growing and reproducing. We work with Dr. Jonathon Geller, Moss Landing Marine Laboratories, to identify taxa using both morphological and molecular methods. The zooplankton field crew (Carl & Ruth) processing plankton samples in San Francisco Bay near the Golden Gate Bridge. Image credit Lina Ceballos. Brianna Tracy and Lina Ceballos take salinity, temperature, and dissolved oxygen readings on retrieval in San Francisco Bay in 2016. "Dragon's Boogers" (Pectinatella magnifica) found at Rio Vista Delta Marina! These freshwater bryozoans form large gelatinous masses and are found only in freshwater.